Happy Tuesday Everyone! I hope you have all got off to a great start to the week! Today we have something extraordinarily beautiful for you to swoon over. This shoot is perfect for those of you who find inspiration in nature and have a touch of rustic flare. With olive trees, lemons and lavender being prominent throughout this shoot I can only imagine how sensational the aromas were, I just wish I could have been there. One can but dream!!! “This shoot was inspired by the natural, beautifully serene surroundings at Rock Creek Vineyard. I wanted to use the “fruits of the land” as main players in the décor. Lush with a gorgeous olive tree grove, vibrant patches of wild lavender and rows upon rows of magnificent grape vines, this private estate offered every element for a breath taking wedding backdrop. Wild deer were continually crossing our paths, galloping majestically through the nearby meadow, as were incredible birds, feasting on the fruits dropped from the orchard trees. The owners and manager of this boutique winery treated us like family, offering their home, land, tasting room (and wine) to us with open arms. Hues of mustard, lavender, creams, olives and greys were brought together, by mixing in beautiful antique furniture and props from Pieces of Time, stunning floral arrangements and garlands from The Pollen Mill and custom signage and vignette styling from Seamless Details. Crystal Lynn Collins Photography masterfully captured the true beauty of these colors and settings in her images. 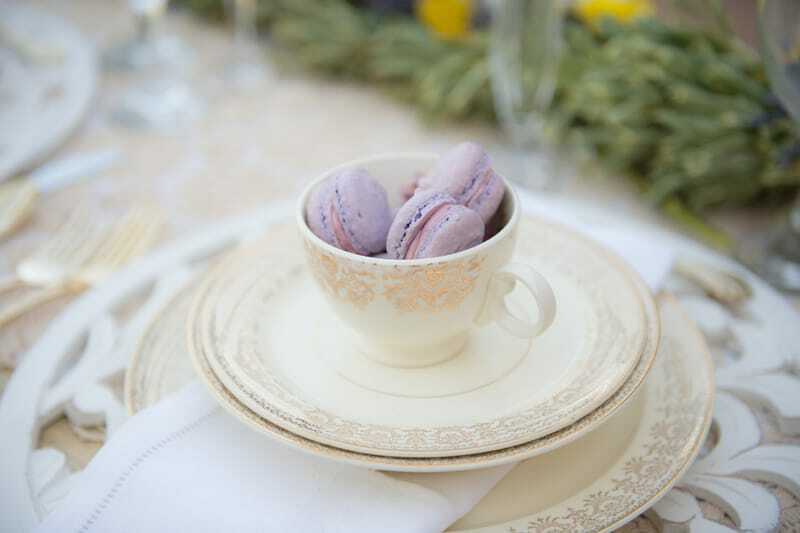 Loving the lavender macaroons ! !